Be part of the future of Caring for Cats, and help us go on rescuing and rehoming cats & kittens in our region. There are so many ways that you can raise vital funds for us – take part in an organised challenge like a marathon or sponsored swim, plan your own event like a bake sale or coffee morning, or maybe you could fundraise via your workplace with donation tins. Whatever you choose, let us know so we can cheer you on and share your fundraising success with our friends and supporters too. Sponsored events – support ours, or organise your own! 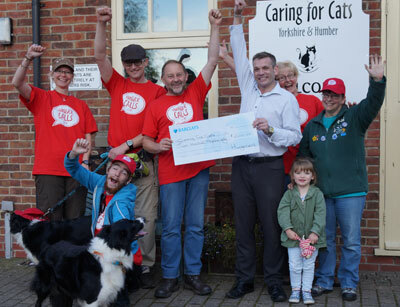 Every year we hold a charity sponsored walk organised by volunteers – see photo right of our 2015 walkers, pictured with a £200 donation cheque from a local business sponsor, when they raised an amazing total of £1006!! You can take part or show your support by sponsoring the group; sponsor forms are available from our homing centre or charity shop. giving up a treat for a month…chocolate, alcohol, PC games, smoking, or watching TV! You can easily create your own fundraising page at our MyDonate site to collect donations online (or click on the MyDonate button below). Let us know and we can also provide official collection tins to make asking for support easier. A great way to involve children so they can learn about animal welfare, community responsibility and have fun at the same time. Organise a kids quiz or raffle, a fancy dress day (maybe as cats? ), a sponsored car wash for family and friends, or maybe a sponsored silence 🙂 Or hold a fundraising stall at a local fair for us. A good way to start is to help us with one of our charity-organised stalls at local fairs and markets which take place several times a year. You can easily create your own fundraising page at our MyDonate site to collect donations online. 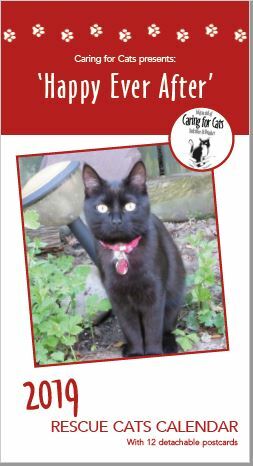 Help us raise funds for free when you shop online – easyfundraising is a brilliant way to raise money for Caring for Cats. Shop online from over 2,700 retailers and they’ll give a donation every time you buy something, at no extra cost. > Register now with Easyfundraising.org! Thanks to Ebay’s charity partner Paypal Giving Fund, you can donate a percentage or all proceeds of your sales to a registered charity. Once your item sells, PayPal Giving Fund automatically collects the donation from your seller account, claims Gift Aid on the charity’s behalf, and passes on 100% of the funds raised to us. When you sell an item, select ‘Donate to charity’ and search for ‘Caring for Cats Yorkshire & Humber’ to select our charity as the beneficiary. Find out more about Ebay for Charity now. 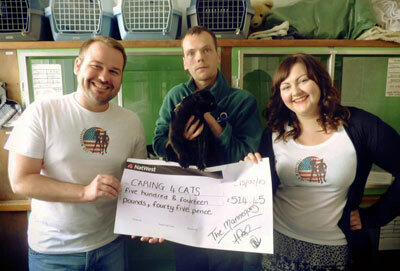 Does your workplace run a charity support scheme? Nominate us for a donation grant or maybe even as their Charity of the Year partner!